Everywhere you look, everywhere you research about arthritis, you’ll hear and read conflicting information. You’ll hear that one person got great results from wearing a copper bracelet, a person or a horse got relief from apple cider vinegar, someone else came back to normal from adding turmeric as a supplement, and so on – and then you’ll read how these things didn’t work for other people – so the whole thing is a load of crap and that arthritis is incurable. I am very glad to tell you that they are wrong. Arthritis IS curable and it IS fixable. There’s a bunch of reasons why the medical profession thinks that arthritis is incurable and that’s because it doesn’t look at the whole person or the whole horse and even bigger than that – it doesn’t look at each being as a unique individual. We are all individuals and to recover from arthritis, we need to be treated as individuals. Because of that individuality, what works for one person may not work for another. For example, one person’s arthritis may be caused by crippling emotional stress; another may have a major mineral imbalance from poorly grown food or a digestive problem that stops them from absorbing their food and minerals properly; another person has high acid in the stomach for whatever reason, yet another has had exposure to chemicals and toxins that have overloaded their system and their body can no longer cope with flushing those toxins – another has repetitive strain on joints from using their bodies incorrectly. Some people have one of these issues, some people have all of them and others have some combination. When we work with horses like we do, horses and their humans can be a beautiful escalating circle of mental, emotional and physical well being. Just as big as that mutually healing concept, horses give us an opportunity to practice and develop our unique Inner Guidance System and our wisdom. As we get better and better with our horses, that expertise spills over into the rest of our lives and makes it possible to for us to know what is right for us and what is not – which of those causes of arthritis we uniquely need to attend to – what is … perfect… for us in that moment. We teach you how to use a simple pendulum while you are developing that expertise during this Program. Kristina’s spectacular recovery from 20 years of crippling arthritis that started in her childhood (if you haven’t seen that video yet, watch it here) – was linked with the horse work that she was doing at the same time and was a beautiful example of a person healing a horse and a horse healing a person with both of them escalating each others’ mental, emotional and physical well being. To that horse work she added the knowledge that we have included in this Arthritis Recovery Program. During my working life of more then 20 years as an alternative therapist, I have consistently helped to reverse arthritis for both people and horses, using an all natural holistic approach. I have lost count of the number of times I have watched and felt the swelling of clients’ arthritis melt away under our eyes – and the great news is, this is now possible with our Arthritis Recovery Program where we’re also getting excellent results. This all natural, powerful Program includes all the knowledge, tools, tips and support that have brought success to all my clients over the years. In this Arthritis Recovery Program, we approach your arthritis from a deeply holistic way so that we can address what is underlying your dis-ease. And a beautiful side effect (you don’t often see those three words together!) of this, is regaining your vitality and zest for life and feelings of happiness and well being. There are seven key ways that we work holistically to help you recover from arthritis. 1. Emotional stress causes muscular tension. If left untreated, this muscular tension will cause enough physical stress that eventually will pull bones out of alignment. This will stress the joints in such a way that the body will make bony changes in an attempt to repair and support what is happening. 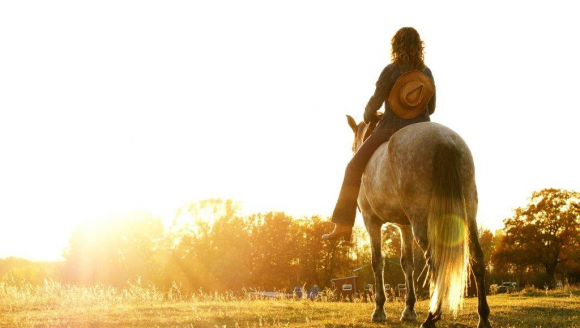 You will use the work with your horse to learn how to understand emotional stress that you may be experiencing now and how to release old emotional stress. Good posture may sound pretty boring to many people but it is a key to healing arthritis – and is also important to your overall health and well being. And good posture has NOTHING to do with that “stand or sit up straight!” stuff that we were taught at school. Good posture can give you back that effortless joy of movement, walking with freedom and strength in your body – something you may not have had for a long while. Through my horse work, I long ago figured out how to teach good posture effectively in an online horse program for an extraordinarily good riding seat. In this Program, we bring the benefits of that into working with your arthritis so that you can achieve good posture in your life and allow your body to heal. Getting the right amount of the right kind of minerals into your body is essential to support the regeneration of the bones and the melting away of those unwanted mineral deposits. Mineral and trace element needs will vary from person to person, district to district and country to country depending on your diet and the way that your food is grown. We will help you to figure out exactly what your unique needs are to support your recovery. Here’s another key that may sound boring and is often overlooked or underestimated. We have to get our digestion right in order to be able to digest the nutrients that we need for arthritis recovery. We’ll look at many different ways to improve your digestion – including some that are really cost effective and taste great too. You may be cringing, thinking of severe green juice or fasting diets but it doesn’t have to be like that. We are more likely to ADD things to help you detox. Your body can’t do its best recovery job while battling a whole heap of toxins at the same time. And given my long time commitment to doing things the easy way, we’ll look at simple and easy ways that you can use to reduce your toxin load. We boost the immune system and reduce inflammation by attending to digestion issues, food sensitivities and food allergies and adding a BROAD RANGE of additional foods and food herbs to speed up the recovery process. We’ll help you to figure out what your unique food sensitivities are that trigger your inflammation to be worse and to work out what anti-inflammatory foods and herbs will personally suit you best. We’ll also look at some budget conscious ways to get what you need out of food. There is a paradox with arthritis. We have all heard the saying “use it or lose it” and yes that is so true – and yet, the paradox is that pain is a signal from our body telling us to stop and sort something out. Working our way through and learning to exercise in ways that takes account of both of these seemingly conflicting and very valuable pieces of information is something you will learn in this Program. When I first started this Arthritis Recovery program as a trial, I struggled to find a way to bring people who didn’t have horses the healing opportunities that horses bring us when we are in that beautiful place of reciprocal healing. Achieving that is still on my to do list. Meanwhile, for those horse people who want to get started NOW, we’ve come up with something absolutely unique to help horse people in particular, to recover from arthritis. We have combined our online program Fast Track to Brilliant Riding with the Arthritis Recovery Program to get the best of everything. And because it’s my 60th birthday this week and to celebrate Kristina’s good news, I’ve decided to gift you with a free addition of the Arthritis Recovery Program for a short period of time. That’s 81 horse lessons and 34 Arthritis Recovery lessons for a subscription of $12.69 per week for a year – or you can make a one time payment of $550 and get all the other bonuses and discounts that come with buying Fast Track up front. You can read more about Fast Track to Brilliant Riding and the bonuses here. AND email me and let me know you want the Arthritis Recovery Program too and I’ll email you the registration for that.